As with most public art, not everyone is sure to cheer. This piece is bright red, three stories tall, made of used utility poles and stretches the length of a football field. So, is it beautiful — and worth $50,000 in public money? That’s the amount of state tax money put into this project by the Michigan Economic Development Corp. It came as a matching grant, after locals raised more than $55,000 via crowd-funding, said Dominic Romano, a community assistance specialist from MEDC who joined Southfield city officials for the recent opening of Red Pole Park. “You’ve got a whole bunch of good things going on here,” Romano said, citing the new installation’s location on a hiking-biking trail that will soon be studded with other pieces of outdoor art. “This will be a gathering place, a place for the community to connect,” said Romano, referring to MEDC’s three-year-old program called Public Spaces/Community Places that has given 176 grants across Michigan. The cluster of 65 red-painted wooden utility poles rises like a post-industrial forest beside the service drive of Northwestern Highway, the Detroit Free Press reported. It’s enough critical mass to draw the eyes of even of motorists tearing past at 75 mph, although from down in the M-10 trench the scarlet spires look more like a colorful new factory’s smokestacks than art. Up close and personal — while walking, jogging, cycling, skateboarding or inline skating — is how people will come to appreciate this modern art, said its biggest booster Ken Siver, the mayor of Southfield and champion of the city’s unique role in showcasing art. Siver led the way in saving art that was nearly lost in the bankruptcy of Northland Mall. No city money was used to do it, he declared. Instead, donations paid to buy the art from the bankruptcy trustees and it’s slowly finding new locations in city buildings. The mayor has enlisted individual as well as corporate backers to extend the city’s identity as a place of abstract beauty in public places. 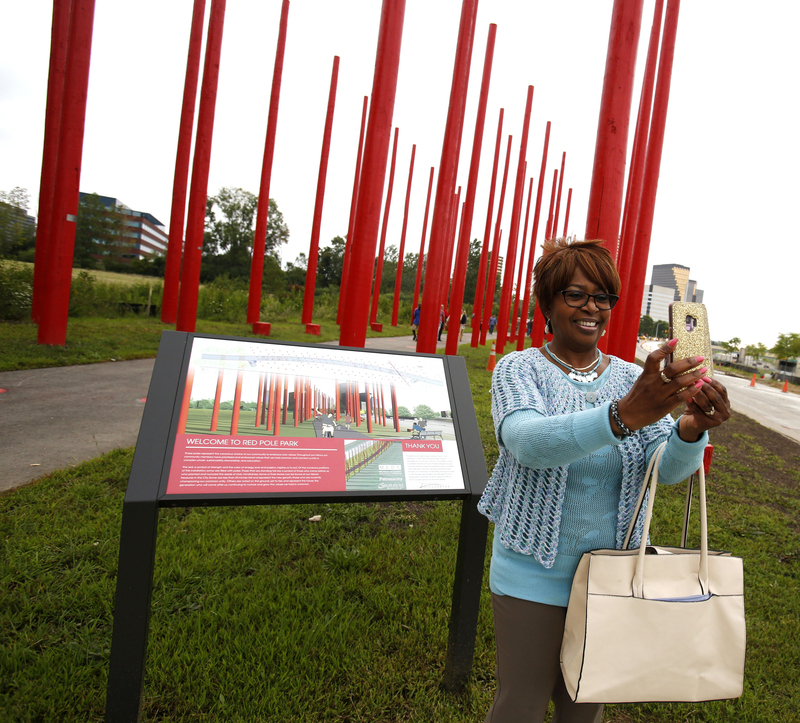 He insists that Red Pole Park will become a beloved new symbol of Southfield. Certainly, its namesake installation won’t be easy to steal or vandalize. The utility poles — of varying heights, aimed “to represent Southfield’s history, its present goals, accomplishments and future growth,” says a city news release — weigh 800 to 1,000 pounds apiece. The poles, slightly used and left on city property by DTE several years ago after a big repair job, were donated by DTE, which also kicked in $15,000 for the art project, said Southfield Planning Director Terry Croad. “On a sunny day, you get beautiful diagonal shadows, all across the park,” he said. “Eventually, we’ll have about 3 miles of path,” linking the city’s civic center and office towers with other offices, a hotel and Lawrence Technological University, he said. Scattered amid the poles are low-lying tree stumps, also spray-painted bright red, and according to a sign beside the trail, represent the city’s “future growth.” Speaking of growth, Red Pole Park is “the first installation in a series of outdoor ‘rooms’ or art installations planned along the Northwestern Highway Shared-Use Pathway and Greenway,” according to a city news release. But this abstract grove will be hard to top, literally.